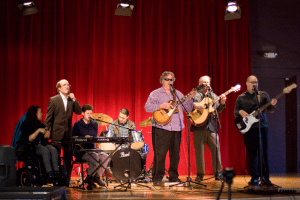 Founded almost 20 years ago, The Note-Ables is a group of professional musicians who shatter the stereotype that people with disabilities have limited talents and abilities. The group first met in April 1999 when they started jamming and writing their own songs together. By that summer they had started playing small gigs in the Reno/Sparks area and have since expanded to performing 30-40 gigs each year. In addition to being professional and crowd pleasing, the group’s activities have also increased the visibility of people with disabilities and added to the dynamic arts community in the Truckee Meadows. With a blend of covers and original songs, the musical style of The Note-Ables ranges from blues to country to jazz to classic rock. The Note-Ables can be seen regularly in the Truckee Meadows at venues such as the Knitting Factory, Wingfield Park, the Pioneer Center for the Performing Arts, and the University of Nevada, Reno. Consider booking The Note-Ables at your next party, fundraiser or corporate/community event. The band will bring diversity, fun and widely enjoyed music guaranteed to bring a smile to your attendees.